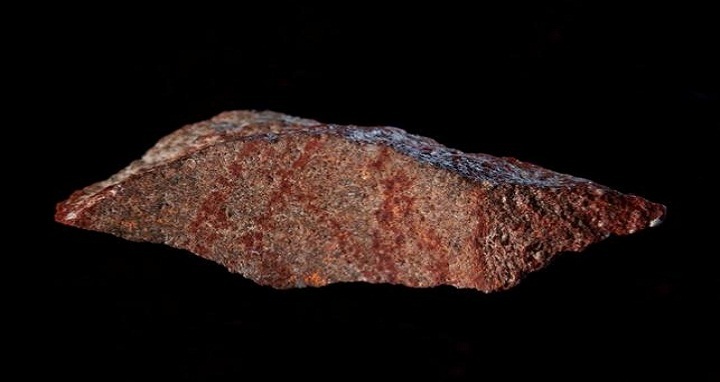 Dhaka, 13 September, Abnews: A small stone flake marked with intersecting lines of red ochre pigment some 73,000 years ago that was found in a cave on South Africa's southern coast represents what archaeologists on Wednesday called the oldest-known example of human drawing. The abstract design, vaguely resembling a hashtag, was drawn by hunter-gatherers who periodically dwelled in Blombos Cave overlooking the Indian Ocean, roughly 190 miles (300 km) east of Cape Town, the researchers said. It predates the previous oldest-known drawings by at least 30,000 years. The cross-hatched design drawn with ochre, a pigment used by our species dating back at least 285,000 years ago, consists of a set of six straight lines crossed by three slightly curved lines. The coarse-grained stone flake measures about 1-1/2 inches (38.6 mm) long and 1/2-inch (12.8 mm) wide.